Almost anybody can safely take up walking, and light to moderate exercise is usually fine for healthy adults with no troublesome symptoms. But do you need to talk to your doctor before taking on a more strenuous regimen? It's wise to talk to a doctor if you have any questions about your health or plan to start more vigorous workouts, especially if you haven't been active recently. Definitely talk to a doctor if you have any injuries or a chronic or unstable health condition, such as heart disease or several risk factors for heart disease, a respiratory ailment like asthma, high blood pressure, joint or bone disease (including osteoporosis), a neurological illness, or diabetes. Also consult your doctor if you suspect you may have an illness that would interfere with an exercise program or if you have been experiencing any troublesome symptoms, such as chest pain, shortness of breath, or dizziness. Take five to 10 minutes to warm up and cool down properly. Be aware that training too hard or too often can cause overuse injuries like stress fractures, stiff or sore joints and muscles, and inflamed tendons and ligaments. Sports prompting repetitive wear and tear on certain parts of your body — such as swimming (shoulders), jogging (knees, ankles, and feet), tennis (elbows) — are often overuse culprits, too. A mix of different kinds of activities and sufficient rest is safer. Listen to your body. Hold off on exercise when you're sick or feeling very fatigued. Cut back if you cannot finish an exercise session, feel faint after exercise or fatigued during the day, or suffer persistent aches and pains in joints after exercising. 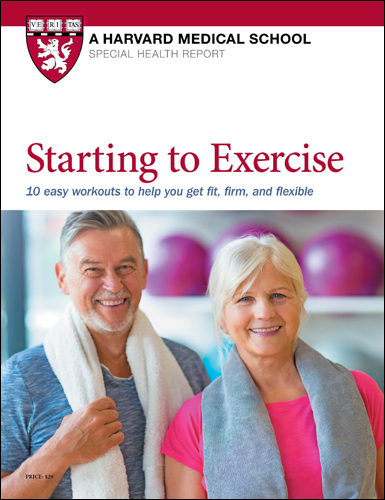 If you stop exercising for a while, drop back to a lower level of exercise initially. If you're doing strength training, for example, lift lighter weights or do fewer reps or sets. For most people, simply drinking plenty of water is sufficient. But if you're working out especially hard or doing a marathon or triathlon, choose drinks that replace fluids plus essential electrolytes. Choose clothes and shoes designed for your type of exercise. Replace shoes every six months as cushioning wears out. For strength training, good form is essential. Initially use no weight, or very light weights, when learning the exercises. Never sacrifice good form by hurrying to finish reps or sets, or struggling to lift heavier weights. Exercising vigorously in hot, humid conditions can lead to serious overheating and dehydration. Slow your pace when the temperature rises above 70°F. On days when the thermometer is expected to reach 80°F, exercise during cooler morning or evening hours or at an air-conditioned gym. Watch for signs of overheating, such as headache, dizziness, nausea, faintness, cramps, or palpitations. Dress properly for cold-weather workouts to avoid hypothermia. Depending on the temperature, wear layers you can peel off as you warm up. Don't forget gloves. Delayed muscle soreness that starts 12 to 24 hours after a workout and gradually abates is a normal response to taxing your muscles. By contrast, persistent or intense muscle pain that starts during a workout or right afterward, or muscle soreness that persists more than one to two weeks, merits a call to your doctor for advice.